I hope to put out a new crossword puzzle each month. 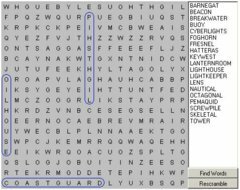 Also, be aware that this crossword puzzle is for the LIGHTHOUSE enthusiast. If you're not into lighthouses, you may have a very difficult time with this. Future crossword puzzles will have some clues related to the current issue of Lighthouse Digest. I will use that magazine for help with the clues and words. So if you're a subscriber, keep the magazine handy when you do the puzzles. Play the classic jigsaw puzzle, but do it in 21st century style and play it online! 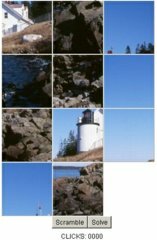 Choose from 26 different jigsaw puzzles, all of them a different photo of a lighthouse. Click on the image below to begin. Another form of puzzles is a sliding puzzle. The object of this puzzle is to slide the pieces into the open area and arrange all the pieces to form the correct completed image. If you want to give up there's an option to solve the puzzle. Click on the image below to begin. Remember getting those puzzle magazines as a kid (or maybe you still do! :-)? On of my favorite word games was the Word Seek game. Here we've got the same game, only on the web. 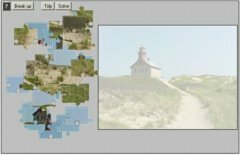 There are approximately 20 lighthouse related words that you need to find in an 18 x 18 character grid. Words can be horizontal, vertical, diagonal, forward, or backwards. Every now and then I'll change the words, so be sure to check back again and again. Also, by clicking on the "Rescramble" button it will hide the words in a different places each time. Click on the image below to begin. It was a board game. It was a TV show. Now it's on the internet. 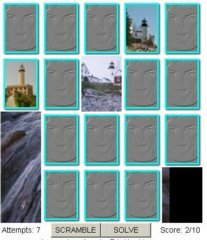 Our game of concentration tests your memory as you try to find matching photos of 10 different lighthouses in a 4 x 5 grid. Click on the image below to begin.